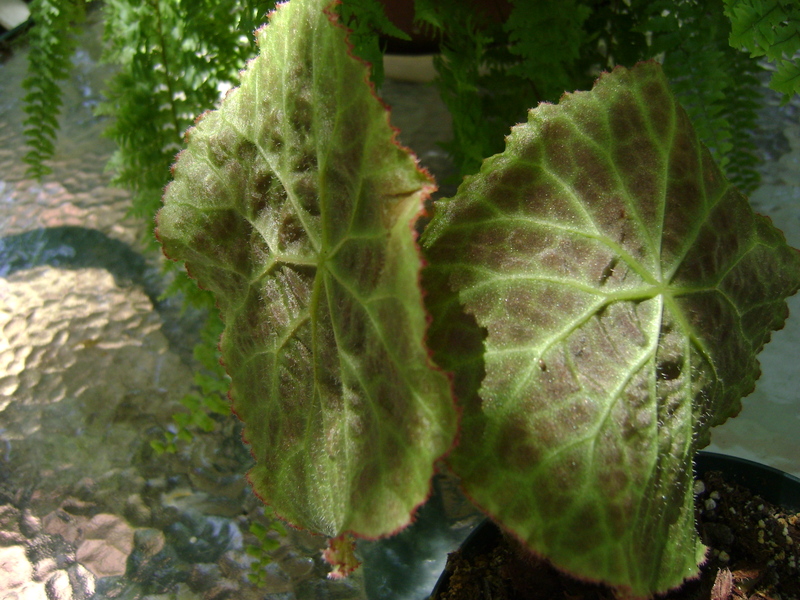 Begonia goegoensis likes bright light and high humidity. I purchased this begonia along with paulensis at the South West Texas Begonia Get Together. 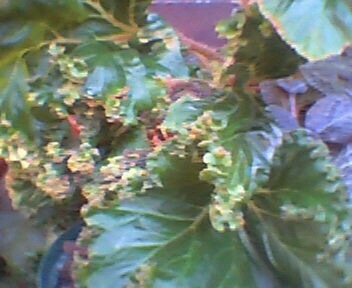 This is another begonia I thought would not survive for me this summer. But surprise surprise it did! This begonia is mostly grown in a terrarium. I don’t like growing plants in terrariums; I want them to grow as large as they can grow, so I keep away from those types of plants. But when you see such unusual begonias like goegoensis you have to try. Well I got so busy this summer that I just set it aside for a while till I could get to it; well I never got to it; I just watered it like the rest of my rhizomatous begonias in the greenhouse and it grew! So I just let it grow. 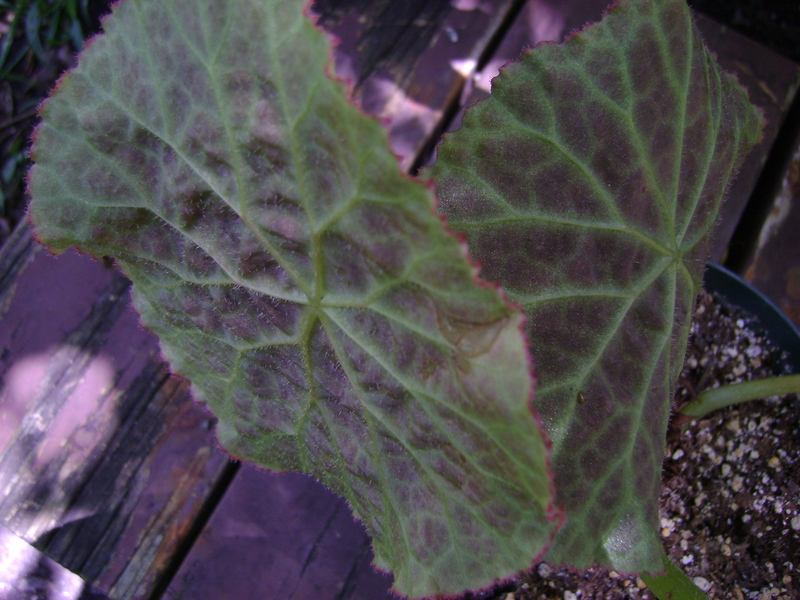 The leaves are a dark brown bubbly bronze color with light green veins; the leaves have a quilt like texture. I love the way it looks. There are a few other begonias that look like it at least to me they do and they are Rajah and George Fewkes at least I think thats how you spell the last one!? Some one out there let me know if this is correct. All I can say is try to grow begonias the best you can; you will be surprised what begonias can tolerate! Please please leave me a comment are ask any questions or leave any suggestions. We can all learn a thing or two from more begonia collectors out there. I purchased this begonia at the South West Texas Begonia Get Together in Ft Worth Texas in May. It is growing! What a surprise, I thought for sure it was going to die! When I was looking at the Angel Wing begonias one of the Begonia Society members from Austin told me to take at look at begonia Paulensis. She said it was a rare one; I told her yeah rare and hard to grow! She said she was going to get one any way so I thought why not try it. I am glad I did! I didn’t do any thing special to it except keep it in the greenhouse and it seems to like it there. It has beautiful almost round pleated green leaves. This begonia is a Rhizomatous begonia it is just so unusual and beautiful! Begonia Muddy waters is rhizomatous begonia, it has dark ruffly crested leaves. 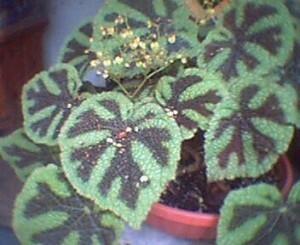 Very pretty and it is a medium to large leaved begonia. My favorite begonias are the rhizomatous begonias. 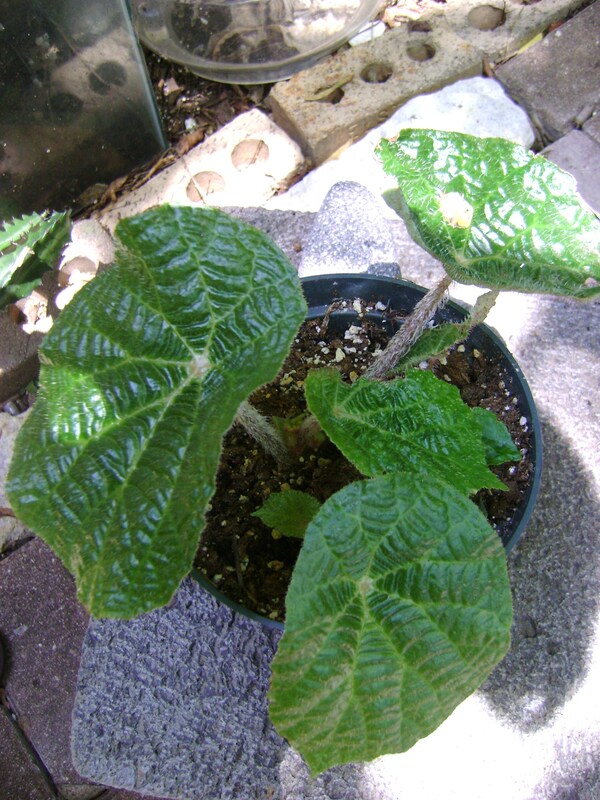 The leaves come in so many shapes and sizes; some as small as a nickle and others as large as an elephant ear. There are many rhizomatous begonias that are easy to grow; you can grow them on a patio or under trees. But there are also a few that are a Little picky, they either like cooler temperatures or high humidity. Once you start to collect begonias you will know which ones will grow in your area and which ones will not. This begonia is a rhizomatous begonia. 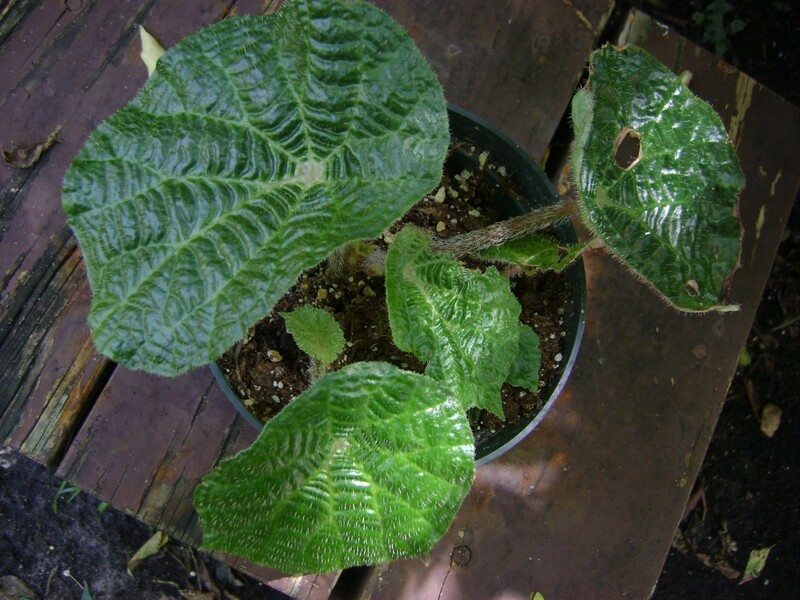 It has large star shaped leaves with lots of red hairs on the leaves and stems. It is a very large grower and needs lots of space. I grow this one in the greenhouse. Make sure you let the soil almost dry out before you water it again. In the summer time you have to make sure you don’t over water your rhizomatous begonias, because it is so easy to over water them. They have rhizomes that grow on the surface of the soil; some rhizomes grow erect. The rhizomes hold water in them just like a succulent that is why it is so easy to over water them. Remember all begonias like cool temperatures. In the spring and fall they are easy to take care of them. But in the summer it is to hot and humid and no matter how hard you try not to over water them; the heat and to much humidity will kill them! One of the most unusual begonias ever! This begonia is also called the lettuce leaf begonia. 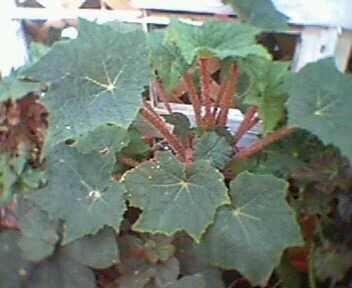 It has large leaves with red veins and the edges are curly and frilly like foam! This is a very huge leaved rhizomatous begonia. The leaves are at least 12″ wide and long. 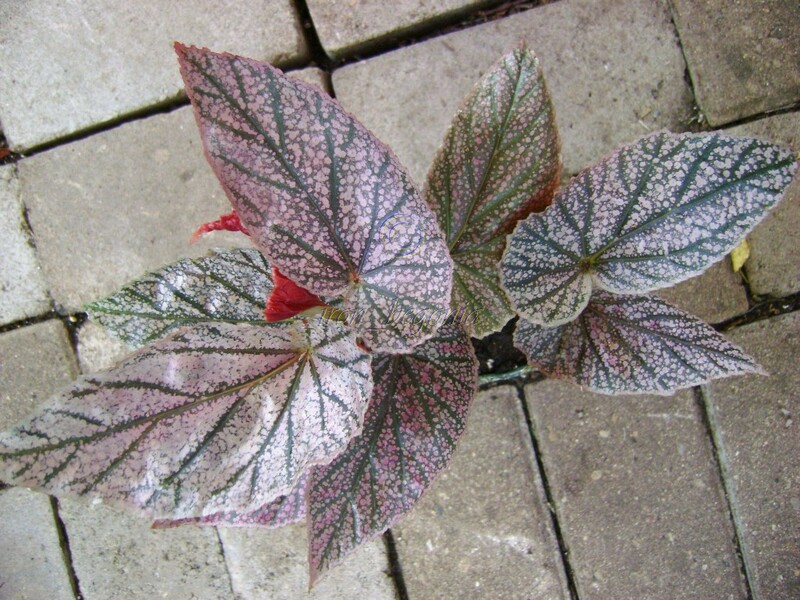 This begonia is one of my favorite begonias it is beautiful! It is one of the begonias I collected first along with the Iron Cross begonia. If you like huge leaved begonias and I mean very huge, then try this begonia. It is so easy to grow, but make sure you have plenty of space to grow this one! I fertilize this begonia every time I water and once a month I water with plain water. Do not fertilize during the winter. The soil mix I use for all of my begonias and episcias also; is 1 part potting soil, 1 part peat moss, 1part perlite or vermiculite or both. You can also use any kind of potting medium like miracle grow. But don’t fertilize your plants for at least 3 to 6 months if you are using potting medium because most of them have a time released fertilizer in them. Also I like to add sand in my begonias it helps with the water drainage so they wont stay wet. 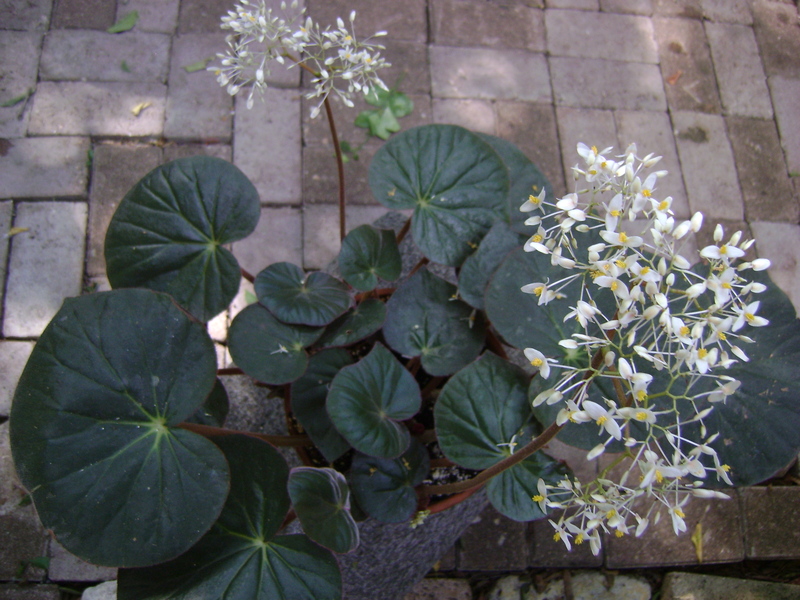 Begonia Acetosa is an heirloom rhizomatous begonia. 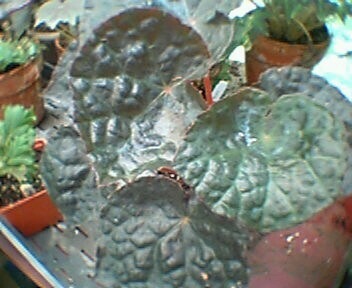 This begonia has soft velvety leaves. The leaves are an olive color on the top of the leaf and underneath it is a blood red/burgundy color. So very pretty! The blooms are tall and form a ball shape, it is an unusual flower. The flowers are tiny and form a large ball of flowers gathered together! If you don’t have this begonia them you should add it to your collection. It is just so unusual. 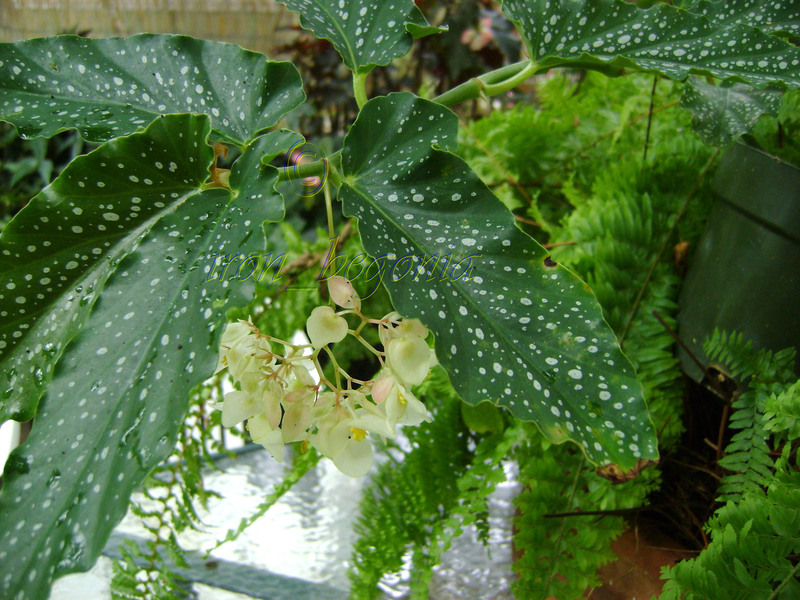 I have this begonia growing in my greenhouse right now. I don’t want to move it because it is growing so well there. 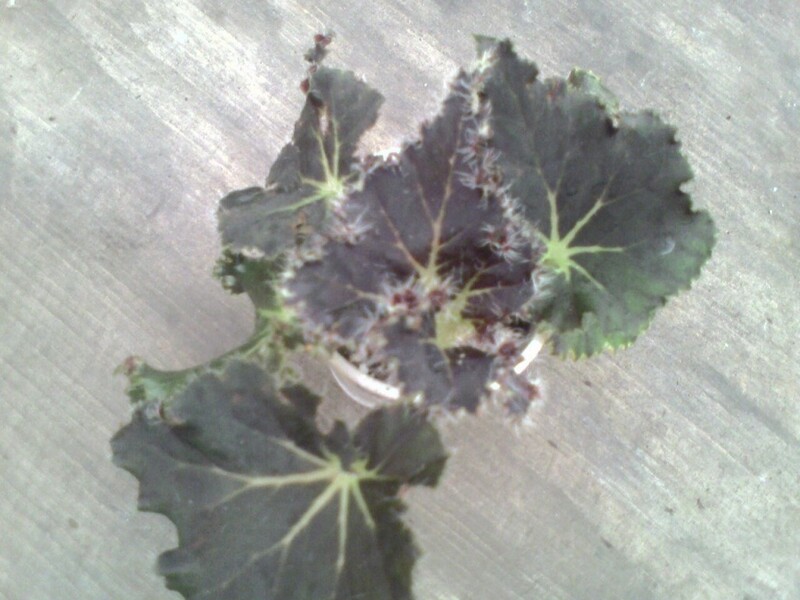 I am a Collector of begonias, the name of this begonia is Begonia Masoniana; it is commonly called Iron Cross begonia. It was one of the first begonias I have ever collected! You can see in the picture why it is called an Iron Cross. 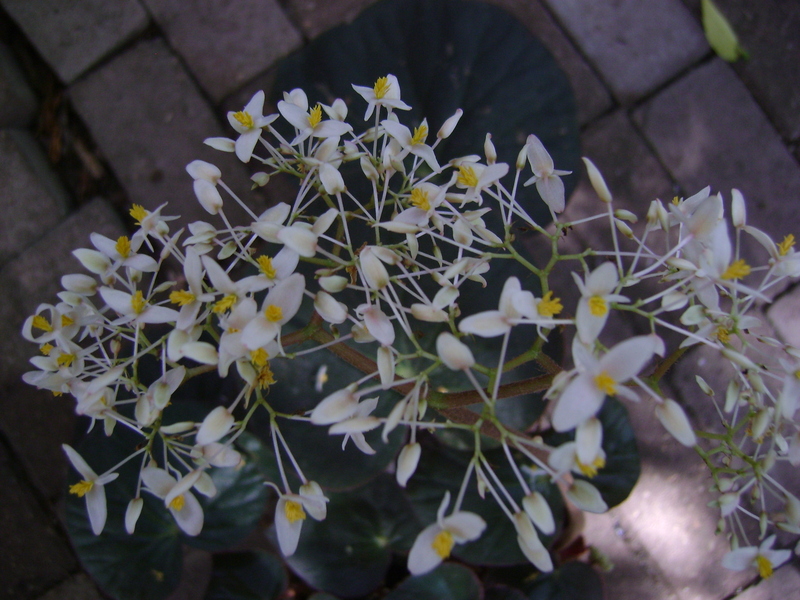 This begonia is called a Rhizomatous begonia; it blooms in the winter. It is easier to grow than a Rex begonia. I will post pictures off Rex begonias soon. Please post a comment, send a picture of your Iron Cross. Ask questions; I have been growing begonias for 25 plus years now. I will be happy to share all I know and if you would like to share your experiences on how to grow, root and take care of this begonia please do share your knowledge so all of the readers of this blog can learn a thing or two me included!